A draft bill released Thursday offers tax cuts to the rich at the expense of the poor and the elderly. After a writing process unprecedented in secrecy and speed, Republican leaders in the Senate have released a draft of a bill intended to repeal Obamacare. In short, the bill doesn’t do that: It just makes Obamacare worse. And while the basic structure of Obamacare survives—albeit in withered form—the Senate bill radically reshapes the traditional Medicaid program, which covers 59 million Americans. To pay for those tax cuts, the bill cuts deeply into Medicaid. Senate Republicans have tried to give the appearance of having “more heart” (to use President Trump’s phrase) than their colleagues in the House. So instead of cutting off federal money for the expansion all at once, as the House bill did, the Senate version gradually cuts off the money over several years. But that “glide path” is meaningless in eight states—Arkansas, Illinois, Indiana, Michigan, Montana, New Hampshire, New Mexico, Washington—where automatic triggers will end the expansion immediately if federal funding declines. The Senate’s phaseout is actually crueler than the House bill, because it affects people who are currently enrolled in the expansion, not just those who would become eligible in the future. More significantly, the Senate bill makes truly drastic changes to the entire Medicaid program, which helps not only low-income Americans but also the disabled and elderly people living in nursing homes. As currently structured, the federal government pays a share of a state’s Medicaid load, with no caps. The Senate bill would upend that structure and impose per-capita limits on the federal contribution. That would cut federal spending on the program by about 25 percent, which health-care experts believe would force states to cover millions fewer people. The Senate bill would also tie Medicaid spending to inflation, which generally increases at a slower rate than health-care spending. Ultimately, the cut to Medicaid could be more than $800 billion. It’s hard to overstate how radical these changes to Medicaid are, both practically and politically. Although gutting Medicaid has long been a pipe dream for Paul Ryan, it’s not something most Republicans campaigned on. In fact, Trump promised while campaigning that he would not cut Medicaid if elected. The GOP has no mandate for so deeply altering the 52-year-old program, and it’s not something the party has tried to justify to the public. Instead, Republicans pretend it’s not happening. “Medicaid is not being cut from our perspective,” South Carolina Senator Tim Scott told reporters as he left a meeting on Thursday morning. Republicans could make a more plausible argument that they have a mandate to repeal Obamacare, but again, their bill doesn’t even do that (thought it does repeal the individual mandate)—it just exacerbates the things people already don’t like about the individual exchanges. Like Obamacare, the Senate bill provides income-based subsidies in the form of tax credits, and recalculates them in a way that may help low-income people. But the bill shrinks the subsidies overall, and particularly for the elderly. It also sets up a new waiver process to allow states to scrap requirements that plans cover certain essential health benefits—meaning lots of people would end up paying more for skimpier coverage and higher deductibles. 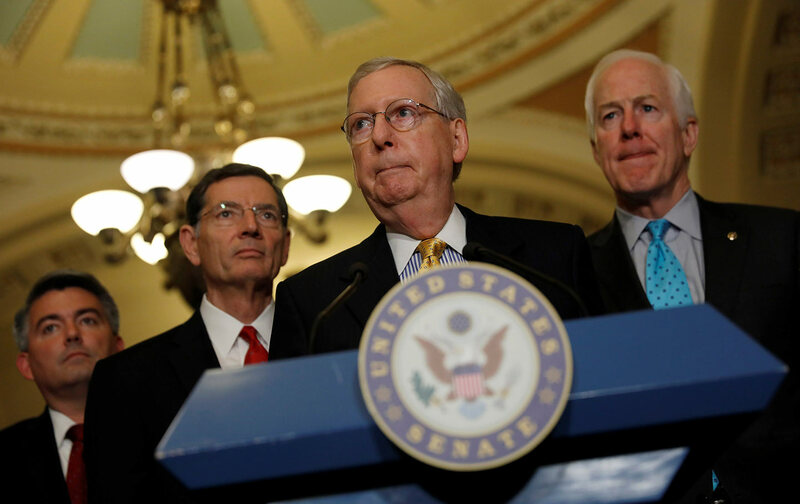 A small handful of Republican Senators are reportedly preparing to announce their opposition to the bill later today. The GOP can afford only two defections. But the text released Thursday is only a discussion draft; party leaders will no doubt tinker and fiddle with the language in order to give the appearance of adding even “more heart.” The baseline for comparison, however, shouldn’t be this Senate draft, or the bill that passed the House. The question is whether the GOP legislation improves on Obamacare and current coverage. It doesn’t come close—unless, of course, you happen to believe that we provide too much help to the poor and elderly, and not enough tax cuts to the wealthy.